The “happiest place on earth” is a top destination on many families’ bucket lists, though admittedly, it’s not the most budget-friendly vacation spot. However, if you plan ahead, this magical, unforgettable destination doesn’t have to put a large dent in your budget. 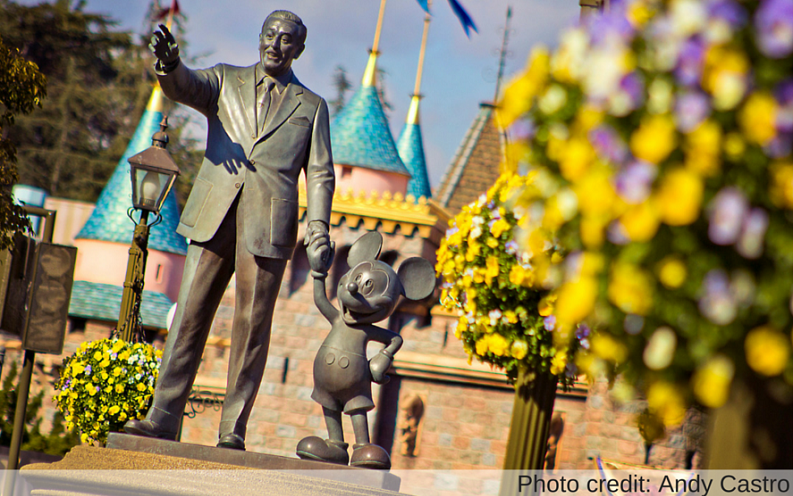 Click through for tried-and-true tips to save money while enjoying your Disneyland experience. Plan ahead so you don’t have to purchase overpriced necessities at Disneyland that you could have brought from home. For example, check the weather ahead of time so you don’t end up shelling out for sunscreen, an umbrella or sweatshirt. Remember, it usually is cool at night in Southern California, even during the summer months, so come prepared. If you are planning on going on water rides and don’t want to get wet, purchase a poncho from a dollar store in advance. You will save money and won’t feel guilty throwing it away afterward. Disney merchandise can be found just about everywhere these days, including Walmart, Target, department stores, Amazon and even your local grocery store. You can save a lot of money by purchasing Mickey tees and mouse ears before your trip at these less-expensive retailers rather than at Disneyland, California Adventure Park or Downtown Disney. In addition to getting a lower price, you also have the benefit of being able to enjoy your souvenirs from day one of your Disneyland vacation. An autograph book is a must-have for Disneyland enthusiasts and a great way to bring some of your memories home with you. However, these books can cost anywhere from $7.95 to $19.95 at the Disney Store and up to $30 for special editions, such as the park’s 60th-anniversary autograph book. Prices vary according to photo sleeves, number of pages, quality and cover art. But there’s no reason you can’t capture these memories for under $5. Consider buying a small, generic photo album, memo pad or notebook — even a Disney storybook from a retailer like Walmart, Target or The Dollar Tree. Personalize your album with photos and stickers. Disneyland charges $17 a day to park in one of their parking lots or structures. Parking for oversized vehicles and vehicles with trailers costs $22 to $27. Most nearby hotels offer shuttle services, often for free — the Candy Cane Inn in Anaheim is one example. If your hotel is in Anaheim, you can also use the ART Shuttle System. Adult day passes are $5; children, seniors and people with disabilities get discounts. If you buy a multi-day pass, the price goes down. Also, keep in mind parking at Downtown Disney is free for up to three hours. If you are planning on using a stroller or wheelchair, plan ahead. You can rent a single stroller at the park for $15 a day. No double strollers are available, but you can rent two strollers for a discounted price of $25 a day. Instead of renting a stroller for multiple days or lugging around your big stroller, buy an inexpensive umbrella stroller for $20 at Babies R’ Us, for example. You also can get a good deal renting one from a rental company such as City Stroller Rentals. Additionally, a manual wheelchair is $12 day and an electronic conveyance vehicle is $50 a day at Disneyland. These rentals require a refundable deposit of $20 and cannot leave the Disneyland or California Adventure park areas, which means you cannot take them to Downtown Disney. A much more cost-efficient option is to rent a wheelchair or ECV for less at a local rental company, such as A Scooter 4 U, Inc. in Anaheim, which offers Disneyland discounts and free hotel delivery. Breakfast is almost as pricey as lunch or dinner if you eat at Downtown Disney or inside the Disneyland parks. You can save quite a bit of money by eating breakfast before you go to the park. Choose a hotel room with a fridge so you can buy milk, cereal or other easily prepared breakfast items the night before — or take advantage of your hotel’s free continental breakfast if available. Continental breakfasts, such as the one offered at Cortona Inn & Suites in Anaheim, start as early as 6:30 a.m. If you want to eat out, eat at a local restaurant that is inexpensive or has a kids’ menu, such as McDonald’s or IHOP, both of which are close to the park. While Disney’s official policy does not allow outside food or drinks, Disneyland does allow most food items. A few things they will absolutely not allow are hard-sided coolers, glass containers, large coolers or alcoholic beverages. However, you can get by with bringing snacks for the day or packing a lunch to enjoy in the picnic area just outside the main entrance of the park. Disneyland will allow you to bring any kind of non-alcoholic liquid into the park, so bring your own soda, juice or milk — fountain drinks and water bottles inside the park are nearly $3 each, but ice and water are free anywhere that sells fountain drinks. If you do decide to eat at the park, avoid sit-down table service like at the Blue Bayou. The counter-service and cafeteria-style restaurants in the park offer better prices. Order a kids’ meal if you don’t need a large portion; it’s less expensive and usually comes with a side and a drink. Disney offers a wide variety of discounts, including discounts for military service members, college students, credit unions, corporate and government groups, teachers and youth groups. If you think you might qualify for a special discount or group rate, call the Disneyland Resort to book tickets. Discounts are offered inside the park, on Disneyland Resort stays, as well as on ticket admission. These discounts can be quite substantial. For instance, a three-day Park Hopper Pass for someone older than 10 years is $235. That same ticket is offered to members of the military for just $132. Make sure to check the details of the discounts offered to special groups because they often have blackout dates or deadlines. Everything from airfare to souvenirs can become more expensive during Disneyland’s busier times of the year. To make the most of your money, plan your trip during the park’s off-season: September through March — excluding December. Hotels are generally less expensive during these months, too. Do not plan a trip around a holiday or special event being held at Disneyland. These times, such as Halloween or Thanksgiving, tend to be especially crowded, even during the off-season. If you cannot plan a trip during the off-season, try to attend the park on a weekday. Arranging your trip around the busy times of the year will not only help you save a little money but will also help you have a better experience overall. At the Disneyland Resort, there are two different kinds of passes you can purchase. The first is a traditional theme park pass, which allows you to enter only one park, Disneyland or California Adventure, for the day. The second is a Park Hopper Pass, which allows you to move freely between the parks throughout the day. You can pay an additional $40 to make any ticket a Park Hopper Pass. Unless you are only visiting for one day, it’s a better idea to purchase the traditional pass and dedicate each day to one park — especially if you’re buying multiple passes per day. Disneyland will usually offer special discounts during its off-season to promote business. These tickets can have substantial discounts, and although they are sold during the off-season, are usually good for one calendar year. Look out for these special promotions to potentially save a lot of money on an upcoming trip. Just make sure to pay attention to blackout dates and other restrictions. In addition to Disney’s offers, many businesses offer coupons you can use on your Disney vacation, For instance, some chain restaurants, hotels and retailers will let you list a favorite location or home location on their websites. If you list Anaheim, you might be granted discounts and coupons specifically for Disneyland. Disney offers Visa credit cards that let you earn rewards, which can be redeemed for Disney merchandise, including DVDs, movie tickets, toys, costumes and Disneyland travel. Additional cardholder perks include a special Meet ‘N’ Greet inside the park as well as 10-percent to 15-percent discounts on merchandise, restaurants and tours inside the Disneyland parks and at the Disney Store. Disney is also offering a $50 statement credit after your first purchase with your Visa card. You can receive a $100 statement credit after your first purchase with the Disney Premier Visa Card, which has a $49 annual fee — the Disney Rewards Visa card has no fee. Of course, using your card responsibly and paying the balance off every month will ensure you don’t rack up debt instead. Kids three years old and under get into the Disney theme parks completely free. Avoid delaying your trip until the kids are older if you can help it. The Southern California Select Annual Passport for SoCal residents, which allows 170 days of admission. Cost: $299 — worth it if you plan on going more than two or three times a year during the off-season compared to a one-day Park Hopper Pass at $155. The Deluxe Annual Passport for 315 days of admission, except some weekends and holidays, is available to anyone. Cost: $549 — worth it if you plan on going at least four separate times a year and want to be able to go during the summer. The Premium Annual Passport allows you to go any day of the year. Cost: $779 — worth it if you plan on going more than six times and want to be able to go to both parks. Bonus: Add a parking pass for $170 — a savings if you plan on going more than 10 times a year. If you are traveling to Anaheim, it is worthwhile to look into package deals. Many hotels offer deals that include things like breakfast, a shuttle pass, free internet and other discounts. It is also possible to get lower rates through a travel agency.Some agencies offer a price match guarantee, which means you can get the hotel deals offered on sites such as Expedia and Orbitz while getting the perks of the agency’s package, like breakfast, discounted Disneyland passes and a shuttle pass. If you are planning to visit several different theme parks while in Southern California, the SoCal City Pass can help you save money as well. This pass allows you to save about 30 percent on park tickets to Disneyland, Sea World and Legoland California. You also have the option to add a discounted pass to the San Diego Zoo and Safari Park. The SoCal City Pass is good for 14 calendar days and you can visit the parks in any order. The Disneyland pass is a three-day Park Hopper with early admittance to the parks, also known as Magic Morning. Seems counterintuitive, right? If you want to have the full Disney experience and don’t mind spending a little more on the hotel, stay at the Disneyland Resort. While the hotel prices tend to be higher than other hotels near the park, staying at the Disneyland Resort hotel comes with a number of perks. The Disneyland Resort offers shuttle services to and from several Southern California airports, including the Los Angeles and San Diego International Airports, plus close access to the Disneyland Monorail. If you stay at the Grand Californian Hotel, you can use the special entrance from the hotel directly into California Adventure. Disneyland Resort guests also are allowed into the parks an hour before the general public on specific days. Finally, Disneyland will sometimes offer discounts on its hotels during the off-season. If you are an annual pass holder or military personnel, you can potentially get even better discounts than the general public. This article originally appeared on GOBankingRates.com: 17 Creative Ways to Save Money at Disneyland. This article by Stephanie Bills first appeared on GoBankingRates.com and was distributed by the Personal Finance Syndication Network.